Perfect Frozen treat for your family in this summer. Try it today with any kind of fruit if you want. Blend strawberries with juice or ice tea. Serve icy cold garnished with a cherry. 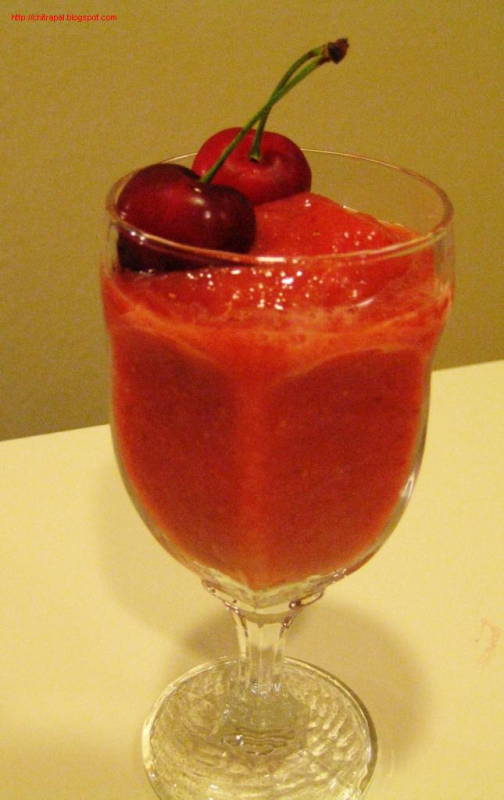 This can be done with any frozen fruit like mangoes, pineapple, berries or even water melon or mix two fruits together. Now you don’t have to spend so much on frozen treat outside and enjoy making your own. Hi ! Chitra , Healthy drink and Awesome Pic . Thank U . Strawberries are excellent source of Antioxidants , Dietary fiber and Anti - Inflammatory nutrients . Strawberries have higher levels of Vitamin C , Fiber , Folate and Potassium than fruits like Apple , Oranges and Banana . Eating 8-10 Strawberries a day can significantly decrease blood pressure , which may reduce the risk of heart disease and risk of cancer . Very gud source of Iodine that keeps thyroid healthy .Enhance Memory power , Prevents Constipation , Aids in weight loss , Fights aging etc . Individuals with history of oxalate forming kidney stones should limit their intake as moderate amt of Oxalates exist in Strawberry .